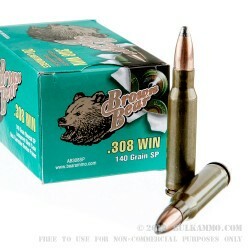 308 Win soft point ammo from Brown Bear won't break the bank! These 500 rounds are an excellent deal on ammo that can be used for frequent target practice, and is a reliable and effective hunting ammo. 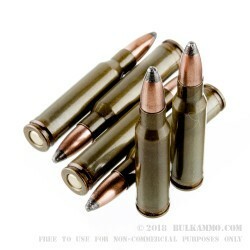 140 grain bullets are higher velocity than the ore customary 150 grain projectile and you may find this has better range than the 150 grain round. 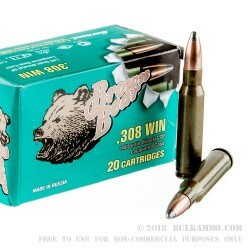 Brown Bear ammo is made in Barnaul, Russia where steel is king of ammo casings. Sealed with a lacquer to help prevent corrosion and improve shelf-life, the Russian manufacturer makes the most of its material and cranks out reliable, cheap ammo for shooting enthusiasts everywhere! Great ammo, ran flawlessly through my M1A and FAL. Shot 2-3 MOA groups at a hundred yards and was pinging a steel plate at 200 yards all day with it. Buy it! Definitely not precision ammo. Don't think that you'll be hitting anything accurate with this ammo. The soft tips are asymmetrical, many misfires in one box and I had some FTE's. Good to hit something 50 yards, you'll be lucky if you hit something at 100. A: Hello Gerry! This ammunition is loaded into steel casings. The bullets used are a Bi-metal jacket construction. 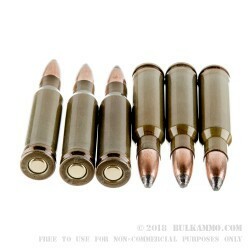 Q: Are these corrosive rounds? A: Brown Bear ammunition states that their ammunition is loaded with non corrosive components. The bullets will stick to a magnet as they are composed of a bimetal material.